Boots on the ground-I hate this phrase. Unless, of course, you mean you literally want to put empty boots on the ground in a war zone. Rain boots, fashion boots, work boots, even combat boots. That’s fine. I don’t care. Air lift all the boots you want anywhere in the world you want and drop them on the ground. Seems a bit pointless, but my real issue is when you expect American soldiers to be wearing those boots. Boots on the ground did not win our freedom and they cannot defend it. Boots on the ground do not die, get dismembered, or suffer PTSD. Soldiers do. Soldiers are more than boots. They are human beings with mothers and fathers, daughters and sons. Sometimes we need courageous human beings to go into battle to fight and possibly die for the values and liberties we prize. 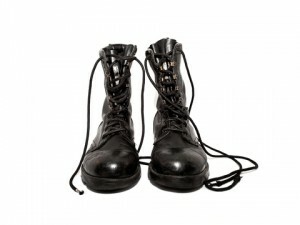 When we dehumanize them and refer to them as boots on the ground, it is too easy to forget the reality of war. The reality of hard battles in harsh environments. The daily choice these soldiers face to kill or be killed. The reality of coming home to an America that seems not to value or acknowledge their sacrifices. We can send American boots anywhere. When we think of sending American soldiers to war, it behooves us to remember they are more than boots on the ground. They are human beings.